Maryland’s Board of Elections put on a demonstration last week of two potential voting systems that will have voters producing paper ballots again for the 2016 Presidential Primary Election. At the University of Baltimore, citizens could test drive the Everyone Counts and ES&S (Elections Systems & Software) universal-voting systems that will produce paper records readable by optical scanners in every precinct. A 2007 Maryland law required the State Board of Elections to have a paper record of each ballot to be used to efficiently for later audits or potential recounts. State election officials insisted the current touch-screen computerized voting was accurate and reliable, and less prone to voter error. The two voting systems under consideration also present other advancements. Both models offer the ability for voters to access and make ballot selections via smartphones, tablets, or computers before submitting the final ballot at the polls. Everyone Counts’ voting system will also give voters the ability to generate a matrix code linked to the ballot on a device, bring it to the voting center, scan the image, and review or change selections before submitting votes. Lori Steele-Contorer, founding CEO of Everyone Counts said, “The system provides extreme efficiency compared to the old system. On top of that there is extraordinary voter satisfaction and administrator satisfaction” in the organizations that have adopted the system. The Everyone Counts voting system will also support persons who don’t have their own devices, allowing voters to use the familiar touch screen system to make selections at the polls. While ES&S, like its competitor, gives voters the ability to generate ballot answers from a mobile device, it is the features of the company’s scanners and tabulators that drew attention. One scanner, a DS200, will process both sides of a single ballot in under six seconds. 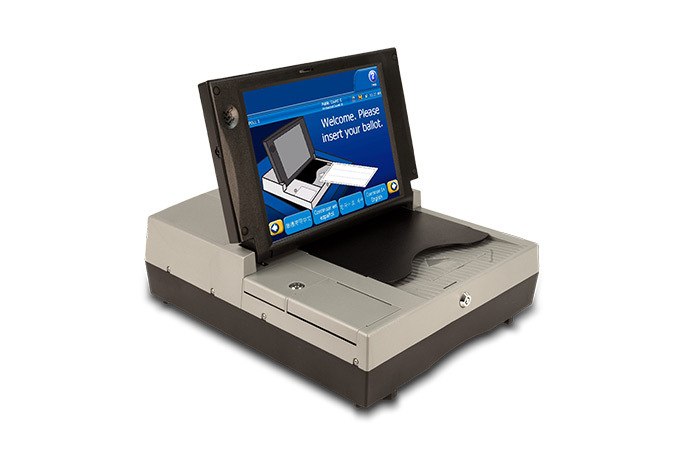 The DS850 high-speed scanner and tabulator can scan 14-inch double-sided ballots at a rate of 300 per minute. Board of Election officials will have adequate time to decide which system to implement. The current touch-screen system will be used in this year’s general election and any 2015 special elections. Funding is expected to be available in time to purchase the new voting system for the 2016 presidential election.